Pro-Zyme is a super concentrate detergent/enzyme blend formulated to quickly and safely digest and break down the toughest heavy soil and grease. When used as directed, “Pro-Zyme” will out clean other types of degreasers and pre-sprays. Usage: Mix two ounces “Pro-Zyme” per gallon of hot water. Spray onto soiled areas of carpet. 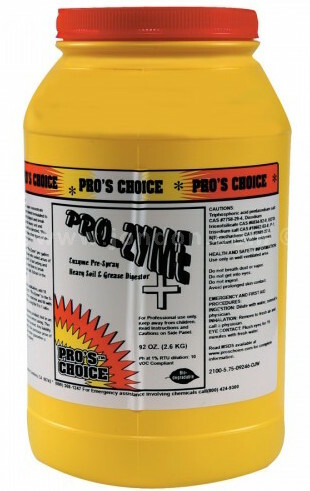 “Pro-Zyme” is fast acting and requires only a short time to break down grease and soil. Extract in the normal manner. For Hydro-Force application, add 16 ounces (8 scoops) “Pro-Zyme” to the 5-quart Hydro-Force reservoir and fill with hot water. Apply using the 9 to 1 ratio.